Sean Lee in action against the Vikings. 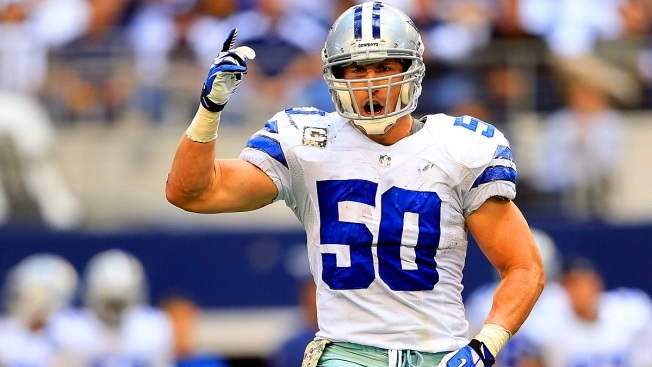 Sean Lee tore his ACL in the first day of organized team activities last May and cast a major dark cloud over the Dallas Cowboys camp leading into the 2014 season coming off a historically bad 2013 season from a defensive perspective. Lee, arguably the Cowboys' best linebacker, missed the entire 2014 season and then watched as the defense had a tremendous turnaround into an average unit with a bunch of no-name players. Now, Lee is looking to be a part of the continued turnaround in 2015, and by all accounts, he's ahead of schedule in his rehab and should be ready to go full speed when the team begins workouts in April. "I think Sean is ahead of target," executive vice president Stephen Jones told ESPN Dallas. Lee's ACL tear was in his left knee, and he tore his right ACL while in college at Penn State. The Cowboys traded a late-round pick for Rolando McClain, who replaced Lee and played very well when he wasn't injured himself. Now, if the Cowboys re-sign McClain this offseason, they'll have to figure out what to do with Lee. "We'll put him in the best spots, but that has certainly been talked about — Sean at [weakside linebacker]," Jones said. "But that doesn't mean he will, for sure, be there. We're kind of looking at a group of guys who can do all of them." Getting Lee back at 100 percent health will be a huge boost for the Cowboys defense that will look to rebuild through the draft this year and put some good, young players around a core that includes Lee, Orlando Scandrick and Barry Church.